BEIJING (AP) — China is telling the U.S. and North Korea to "hit the brakes" on threatening words and actions and work toward a peaceful resolution of their dispute, in a sign of growing concern over the standoff on the part of Pyongyang's only major ally. Foreign Minister Wang Yi said in a phone conversation with his Russian counterpart, Sergey Lavrov, that the two countries should work together to contain tensions and permit no one to "stir up an incident on their doorstep," according to a statement posted on the Chinese foreign ministry's website. "The most important task at hand is for the U.S. and North Korea to 'hit the brakes' on their mutual needling of each other with words and actions, to lower the temperature of the tense situation and prevent the emergence of an 'August crisis,'" Wang was quoted as saying in the Tuesday conversation. The ministry quoted Lavrov as saying tensions could rise again with the U.S. and South Korea set to launch large-scale military exercises on Aug. 21. "A resolution of the North Korea nuclear issue by military force is completely unacceptable and the peninsula's nuclear issue must be peacefully resolved by political and diplomatic methods," Lavrov was quoted as saying. China is North Korea's main economic partner and political backer, although relations between Beijing and Pyongyang have deteriorated amid the North's continuing defiance of China's calls for restraint. In recent months, China has joined with Russia in calling for the U.S. to suspend annual military exercises with South Korea in exchange for Pyongyang halting its missile and nuclear tests as a first step toward direct talks. 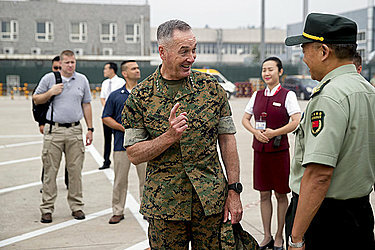 On Wednesday, the chairman of the U.S. Joint Chiefs of Staff, Marine Corps Gen. Joseph Dunford, continued a visit to China following talks the day before with his Chinese counterpart that touched on North Korea. No details of the talks have been released. Dunford on Tuesday told Fang Fenghui, chief of the People's Liberation Army's joint staff department, that the sides had "many difficult issues" between them but were willing to deal with them through dialogue. On Monday, Dunford was in Seoul to meet with senior South Korean military and political officials and the local media, seeking to ease anxiety while showing his willingness to back President Donald Trump's warnings if need be. The U.S. wants to peacefully resolve tensions with North Korea, but Washington is also ready to use the "full range" of its military capabilities, Dunford said. His visit to Asia, which also will include a stop in Japan, comes after Trump last week declared the U.S. military "locked and loaded" and said he was ready to unleash "fire and fury" if North Korea continued to threaten the United States. North Korea's military on Tuesday presented leader Kim Jong Un with plans to launch missiles into waters near the U.S. territory of Guam and "wring the windpipes of the Yankees," even as both Koreas and the United States signaled their willingness to avert a deepening crisis, with each suggesting a path toward negotiations. The tentative interest in diplomacy follows unusually combative threats between Trump and North Korea amid worries Pyongyang is nearing its long-sought goal of being able to send a nuclear missile to the U.S. mainland. Next week's start of U.S.-South Korean military exercises that enrage the North each year could make diplomacy even more difficult. During an inspection of the North Korean army's Strategic Forces, which handles the missile program, Kim praised the military for drawing up a "close and careful plan" and said he would watch the "foolish and stupid conduct of the Yankees" a little more before deciding whether to order the missile test, the state-run Korean Central News Agency said. Kim appeared in photos sitting at a table with a large map marked by a straight line between what appeared to be northeastern North Korea and Guam, and passing over Japan — apparently showing the missiles' flight route. 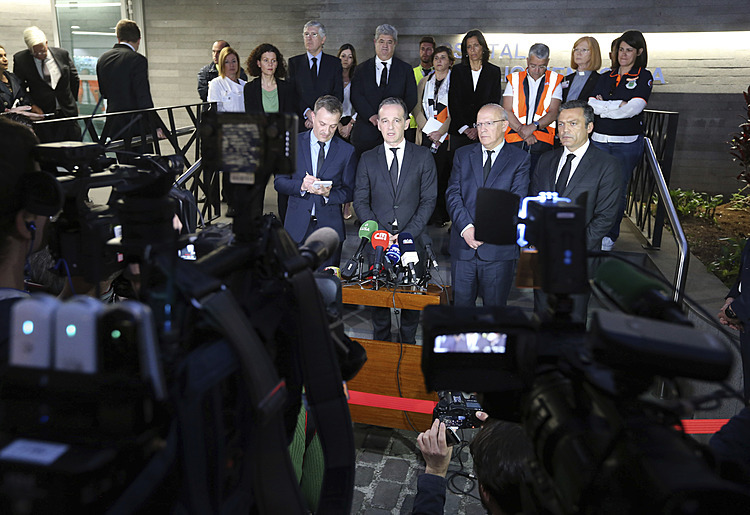 The missile plans were previously announced. Kim said North Korea would conduct the launches if the "Yankees persist in their extremely dangerous reckless actions on the Korean Peninsula and its vicinity," warning the United States to "think reasonably and judge properly" to avoid shaming itself, the news agency said. U.S. Secretary of State Rex Tillerson told reporters in Washington on Tuesday, "We continue to be interested in trying to find a way to get to dialogue, but that's up to (Kim)." South Korean President Moon Jae-in, meanwhile, a liberal who favors diplomacy, urged North Korea to stop provocations and to commit to talks over its nuclear weapons program. Moon, in a televised speech Tuesday on the anniversary of World War II's end and the Korean Peninsula's liberation from Japanese colonial rule, said Seoul and Washington agree that the nuclear standoff should "absolutely be solved peacefully." He said no U.S. military action on the Korean Peninsula could be taken without Seoul's consent. North Korea's military said last week that it would finalize the plan to fire four ballistic missiles near Guam, which is about 3,200 kilometers (2,000 miles) from Pyongyang. It would be a test of the Hwasong-12, a new missile the country flight-tested for the first time in May. The liquid-fuel missile is designed to be fired from road mobile launchers and has been described by North Korea as built for attacking Alaska and Hawaii.